Of course the point here is not that *serious* first ladies from relatively poor countries should not have aides. Rather, it is that leaders from these countries should have the sense to act like servant-leaders, and that begins with caring about the optics of being seen to carry one’s own bag. Who is the African child on the cover of William Easterly’s new book? UPDATE: A reader, C. Mwangi, just brought to my attention this quote from William Easterly’s 2009 review of Dambisa Moyo’s Dead Aid. Moyo is onto something important but, as she says, seldom discussed openly. One of development’s dark secrets is its still-influential origins in the “poor people are children” view, a view with a deeply rooted and very long history. The “development” metaphor was itself is a biological one: poor people “develop” from childhood (poverty) into adulthood (prosperity). Some of the signs of this mindset are subtle but unmistakable. Just think of who was pictured in the last glossy “aid to Africa” brochure you saw? I am willing to bet it was African children. As David Rieff said in his classic book A Bed for the Night, “There are two groups of people who like to be photographed with children: dictators and aid officials.” And of course, you don’t let children manage their own affairs; the adults must do it for them. The rest of the review, originally meant for publication in the LRB, is available here. 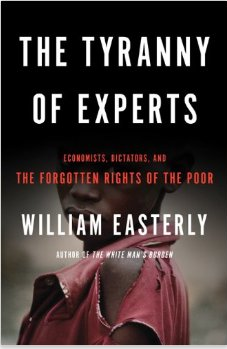 They say don’t judge a book by its cover, but if it wasn’t for Bill Easterly’s reputation for sound thinking on matters to do with Development, I would not have pre-ordered his upcoming book The Tyranny of Experts. Seriously, as a new year resolution can we all promise never to fall into the temptation to include anonymous African children (invariably looking poor and shabby with flies on their faces or carrying guns, among other things) on the cover of books on poverty and development? PLEASE? It is no longer good form (and never has been), especially coming from people who ought to know better. Were the boy’s parents or guardians consulted? Do they even know that their kid is on the cover of Easterly’s book? The book title suggests that Easterly cares about the forgotten rights of the poor, yet the use of the cover image violates an important right of the poor: the right against unfair objectification. There is research out there suggesting that African states face an FDI inflow penalty simply because they are African. Images like these on the cover of books do not help the cause to reverse this reality. To be fair (as a commenter pointed out to me on twitter) it is the publishers who decide these things to drive sales. But authors still have a right (and in my view, a duty) to ensure that this sort of stuff doesn’t happen. I feel bad calling out Easterly on this because he is one of the more nuanced and very sane development economists/practitioners out there (and there are certainly far much worse instances of this phenomenon out there); but the habit of using a whole region and its peoples as shorthand for poverty, underdevelopment and dysfunction has to stop. And it starts with each and every one of us. Following the success of Dead Aid (which I enjoyed very much), Dambisa Moyo tried a repeat with Winner Take All – a book on China’s rising dominance of global commodity markets – with very little success. The first half of Winner Take All is mostly a recount of statistics (most of which are already in the public domain) and general information on the state of the global commodity markets. It is not until the second half of the book that Moyo delves into the real issues regarding her subject matter – global commodities and China’s insatiable appetite for the same. But even then, the chapters are rather short on actual information on China and are instead full of comparative statics with the rest of the world (or more accurately, mostly the United States of America). Moyo is not a China expert, and it shows in Winner Take All. If you are looking for an indepth take of Chinese firms involved in the global commodity markets, their specific investments, strategies and relationships with the Chinese authorities, you will be disappointed. Moyo simply treats all of China as a single actor. There is no domestic politics. There is no discussion of redistributive concerns within China and how they will impact China’s economic performance. There is no nuance on the potential impact of China’s impending demographic decline (except in the concluding chapter). In the end the whole thing reads like it should be a special in the Atlantic Monthly rather than a stand-alone book. The book, mistakenly, falls into the trap of Western declinism, suggesting that China will undoubtedly emerge to be the ultimate monopsonist in the global commodity markets (almost unchallenged). There is also loose talk of potential for conflict over resources – something that is contradictory to discussions in other sections of the book that emphasize the symbiotic relationship between China and the rest of the world. The greatest strength of the book is its balanced take on the economic, political and social effects of the rise of China – especially with regard to Chinese investments in the rest of the world. The “Angola Model” of infrastructure-for-resources, discussed in the book, is far superior to the Swiss-accounts-for-resources model that has been the preserve of the West in many resource-rich developing countries over the last half century. Winner Take All is a far cry from the provocative Dead Aid. It lacks a substantive discussion on the political economy of China’s economic rise (whether domestically or globally). Instead, it gives perspective (for those not in the know) of the implications of China’s economic rise. Most importantly, it is also a welcome addition to the works of scholars like Deborah Brautigam who continue to remind us – and rightly so – that China’s economic adventures in the developing world have net positive benefits, despite the overwhelmingly negative press. For this reason I would recommend the book. Dear readers, apologies for the sparse blogging over the last couple of weeks. Being a third year PhD candidate, yours truly is in the middle of getting the dissertation prospectus approved before going to the field this summer and beyond (not to mention grading and writing end of term papers). Regular posts will resume in early June. Dambisa Moyo’s new book: Winner Take All. The history of medieval Africa. Political Topographies of the African State. Party Politics and Economic Reform in Africa’s Democracies. Sean Hanretta’s book on Yacouba Sylla and Islam and Social Change in French West Africa. Expect a review of Boone’s Political Topographies in early June. A reader gave this link to a certain critique of Moyo’s “Dead Aid.” The criticism offered by this gentleman, although weighty in its own right, has not changed my admiration of Moyo’s work. The fact of the matter is that Africa needs to rid itself of dependency on well wishers from wherever on the globe. Moyo’s book, because it is intended for general consumption, lacks the regressions and seminar-like proof that some of her critics are asking for. It does not take a statistical genius to realize that it was Western aid that propped the corrupt (and most probably mentally challenged) Bokassa. And the simple argument that correlation does not imply causation does not fly either. It has been more than forty years of western aid to Africa without any meaningful development. Within the four decades, if there was something else other than aid that was retarding African development we should have discovered it. The fact that we have not means that aid might be the problem. And what Moyo proposes is a viable alternative. And to be honest, the main reason why I am in full support of the Moyo way is not because I am sure that it would succeed. It is for the simple reason that it would give Africans agency in their lives. It would force African governments to govern their people humanely. And it would reduce African dependency on the rest of the world. Anyone who has taken time to observe Africans’ interaction with the rest of the world knows the enormous degree of self-doubt that Africans have. Grown men take off their hats to kids the ages of their grandchildren simply because they are not from the Continent. This much needed self-confidence will only be achieved when Africans truly take charge of their destiny. Moyo offers an option that might lead to this.